“Zipline to Success: Fast-Track Marketing Strategies to Accelerate Your Sales & Profits” by Claudia Newcorn is the perfect book for small businesses, providing practical information on how to grow your business and make more money without a substantial marketing budget. “Zipline to Success” will help. There are several things that drew me to this book, the title being the first feature to lure me in. “Zipline to Success” suggests a fast-track to success that I could easily relate to, by likening the marketing communications experience to the popular outdoor aerial activity. By navigating viable methods to avoid hitting trees using your zipline equipment, the author lays out simple (but not easy) steps to achieve your goals. “Zipline to Success” is not an unmanageable volume to read; instead it provides concise clear guidance in easy to understand language that you won’t need a PhD to decipher. The author notes that while everything contained in this book is relevant to your business, certain concepts are essential. These concepts are highlighted as Zipline Essentials and there are 27 of them interspersed throughout the book. You will definitely want to take notes or use a highlighter pen while reading as there is a wealth of information contained in each of the 7 parts of this book. But worry not – the layout of the information is yet another feature invaluable to your success. At the end of each part the author provides Zipline Highlights – bullet points to sum up the information. As well, there is a convenient summary of all the Zipline Essentials in the final pages of the book, and readers also have access to bonus marketing resources and tutorials. 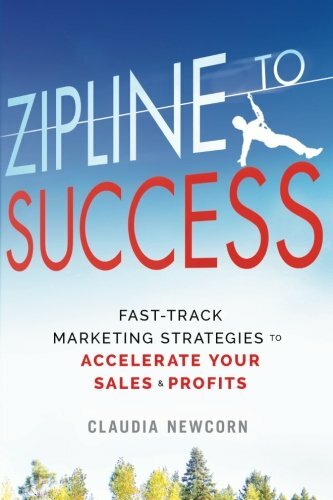 The real examples, success driven strategies, and clear guidance makes “Zipline to Success: Fast-Track Marketing Strategies to Accelerate Your Sales & Profits” by Claudia Newcorn a must-read for all small business owners, managers and entrepreneurs.